The only exit from the valley is “Bekabad Gates“, which is 20 meters wide. The territory of the valley is 77.9 thousand square meters. The elevation is 300-1000 meters above the sea level. 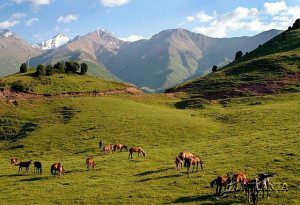 The Ferghana Valley is made up of three regions (viloyats). They are Ferghana, Namangan and Andi-jan regions. About the rich farming, agriculture and craftsmanship of the valley which certifies that the people led a non-nomadic way of life. Owing to the archaeological expeditions organized in Soviet times a few dwellings of a primitive person were found. 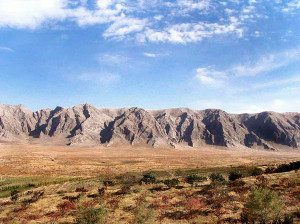 It was Davan (The Ferghana Valley) that gave an impetus to the development of The Great Silk Road. Such unique architectural monuments as Buddhist Temple remains near Kuva and Friday mosque of Kokand astonishing with its size and the beauty of its 98 columns sit in Ferghana Valley. Many monuments date back to the 18-19th centuries, which was the height of Kokand khanate. Palace built in late 19th century, which became the symbol of the whole valley. Kokand was the capital of Kokand khanate from the 18th to the 20th century, which was one of the three states on the territory of present Uzbekistan after the collapse of Shaybanid Empire. Margilan, one of the most ancient cities of Ferghana Valley, is presently considered to be the center of silk-weaving in Uzbekistan. Silk fabrics manufactured here were well-known for their picturesque and the rich ornament and color. Rishtan is famous for its ceramics masters .This craft is still in place owing to a few craftsman families passing the secrets of output from generation to generation. Rishtan ceramics stands out with its rich décor where the blue color dominates. 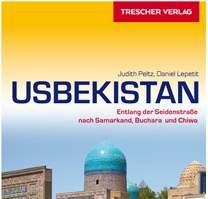 Another city, Andijan, is known as Zahruddin Bobur’s motherland. He was a great military leader and a poet one of the last descendants of Timurids and the founder of Great Moghul Empire in the 16th century. Shahimardan city which sits on the height of 1500 meters above the sea level calls attention of nature lovers.